Hard to believe that Boston Comic-Con is almost a month ago! One of the people I was psyched to meet was Phil Jimenez. I have been a fan of Jimenez' work for a while. I really loved his work on Wonder Woman. 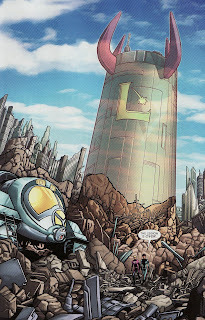 And recently, I really enjoyed his take on the Legion Academy in the Adventure Comics relaunch. Incredibly, Jimenez was doing free commissions at the show, fantastic head/bust shots with some unique and interesting backgrounds. As a result the line for his table was quite long which allowed me to listen to the conversations Jimenez engaged in. I have to say, the conversation was fantastic. Jimenez is really passionate about comics. There was great talk about just about everything from Wonder Woman to Aquaman to the dark edge of comics and a variety of other topics. Just great stuff. During my time in line I saw some great commissions - Magik and Wonder Woman were quite popular. But someone even got a Transformer! And wandering by later in the day, I saw Jimenez drawing Alley Kat Dabra! Awesome. I love this Supergirl commission, a sort of pensive Kara with a great space background. As a 'con courtesy' I try to limit the number of issues I bring to a creator for signatures to 6-8. If it is one of my all time favorites, maybe I'll stretch it to 1o. 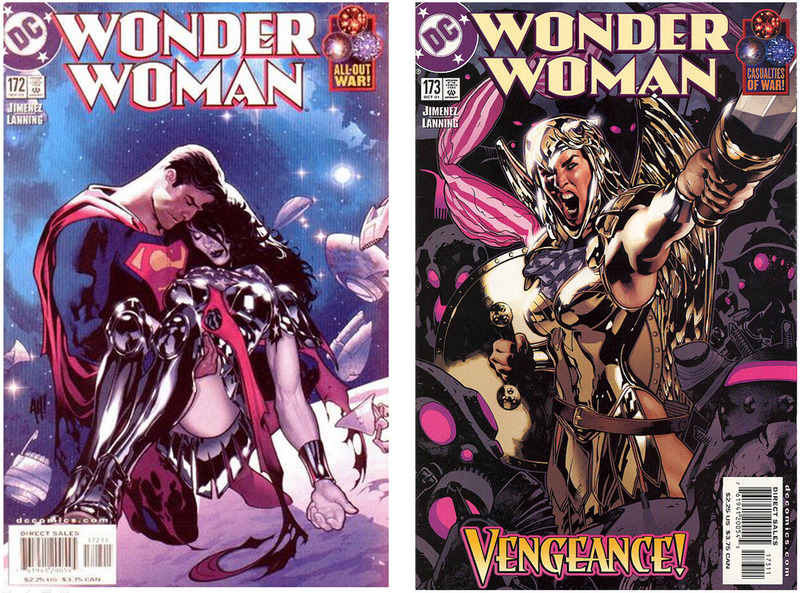 Anyways, I couldn't wait to talk to Jimenez about these two issues of Wonder Woman, the Worlds At War crossovers. These are incredible issues, extremely dense with inset panels, crazy number of characters involved, and wild action. These issues are exhausting to read and absorb/process. They are the closest thing you can get to Crisis on Infinite Earths. So I was thrilled to get them signed by Jimenez and gush a bit about them. But seriously, the best thing about meeting Jimenez was just taking part in the conversation while I waited. Great stuff! Superman #23 came out this week, the latest chapter in the Psi-War. 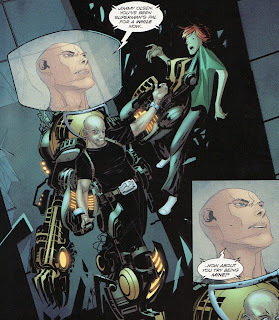 Psi-War has been the most interesting and entertaining arc of the Scott Lobdell era on the book with a lot of moving parts and a formidable number of foes aimed at taking out the Man of Steel. This issue moves the arc forward by adding another faction to the war, bringing in another player that needs to be dealt with. And while that makes this story that much more complicated, it also made me ask a couple of questions about the future of some of these characters. And Superman is almost a spectator in this issue, thrust into the background of the psionic maneuvers of the combatants. The book also seems something of a substitute special. Old Supergirl scribe Mike Johnson is listed as writer. I can't believe he wrote this issue de novo; I have to believe this was plotted by Lobdell. But there is no plotting credit to be found. I was glad to see Johnson's name because I thought he was moving things in the right direction on Supergirl before H'El on Earth derailed all the progress he made with the character. And art on the book is done by Jesus Merino over thumbnails by Eddy Barrows. I am not surprised to see that Barrows can't finish the book. He never seems to be able to put even 2 issues in a row on a title. Merino has a rougher style than Merino. But you can feel the Barrows-ness of the art throughout. 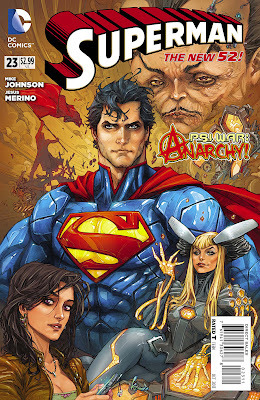 I do like the Kenneth Rocafort cover here, a sort of classic montage character piece. In particular I liked the 'army in silhouette' on the left upper corner, adding just a hint of action to the piece. We start with the origin of the Psycho Pirate, a villain we just met over in Superboy. An omnisicent narrator, observing presumably psionically, calls him a 'sweaty nerd' who grabs the Medusa Mask out of a museum display. The mask is supposed to have tremendous powers. But the man is also identified as one of The Twenty. Remember, these are twenty people who went and stayed missing after the Brainiac attack, granted ultimately fatal psionic powers, and living amongst us hidden telepathically. The Twenty folks we have met have all sported massive Brainiac-like heads and end up dead, burned out by the virus. This person thinks the mask's powers will protect him from the virus. I have to assume it will because I don't think a new Psycho Pirate will be killed so soon after introduction. Nor do I think he'll end up with a huge head. Meanwhile, Superman battles the Queen Bee. The HIVE leader was kicked out of her headquarters by Hector Hammond last month and she is trying to gain control of Superman to use him as a weapon-drone. We also learn that the Queen is also a member of The Twenty (how many have we officially met now? Five?). So I doubt the svelte and sultry Queen is going to end up sporting a huge brainy cranium either. Could her headgear somehow protect her too? 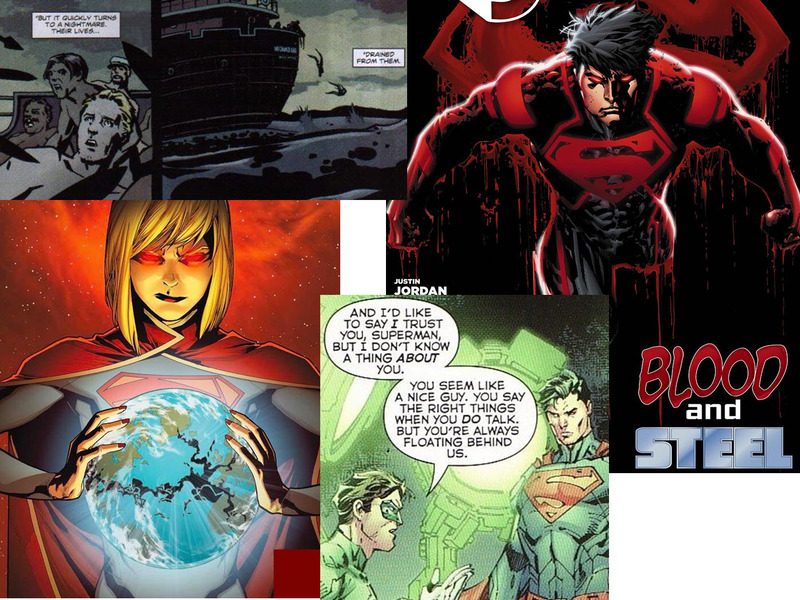 And it is interesting to see the different motivations of those effected by Brainiac. Some want to simply hide. The Senator wanted to try to defend the Earth from aliens. The Queen wants to subjugate everyone. I like how Superman calls her plans to eliminate free will as condemning people. Nice art here, especially the crackling Queen, showing her power. 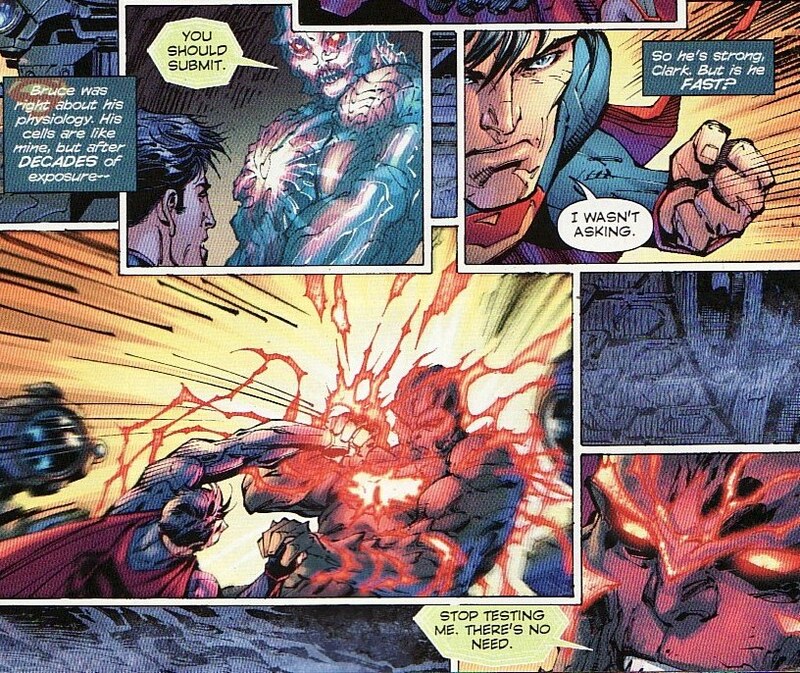 But I also like how the Queen belittles Superman, calling him primitive for trying to solve matters with his fists. And the story does a good job showing how tough it would be to fight someone who can basically cast illusions, fight physically with telekinesis, and attack the mind on top of things. Even super-senses can't help. It is Superman's difficulty with psionics that makes as compelling a story as it is. 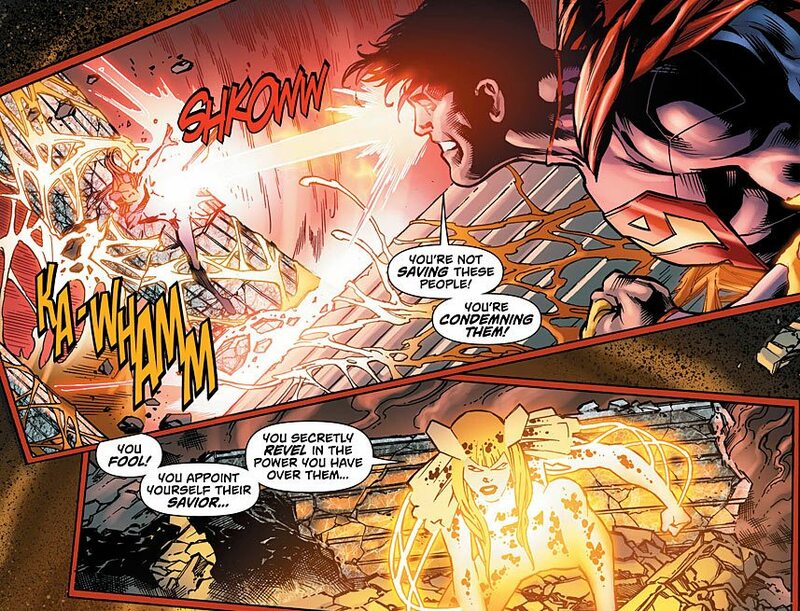 Despite Orion's mental blocks, Superman actually succumbs to the Queen's attack, falling under her sway. And at that moment where he is enslaved, Lois (who recently has become a member of the Twenty) is psionically startled out of her slumber. Most will know that I am not a big fan of her new boyfriend Jon. It must be rough on him to be holding a bedside vigil only to have Lois' first word be 'Superman'. The snarkiness of the omniscient narrator who comes along for the whole issue should have tipped me off about who that voice belonged to. The two warring factions in this PsiWar are Queen Bee and Hector Hammond. Hammond arrives at the Queen's stronghold and prepares to attack. 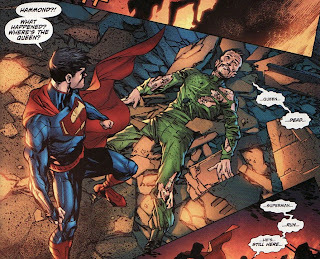 While some of the Twenty want to prepare for Brainiac's return to fight him. It turns out the Queen's motives are very different. She wants to enslave humanity to prepare the world for Brainiac's arrival, serving up the populace on a platter. She is loyal to Brainiac. Now that is an interesting wrinkle. She seems so independent and narcissistic. I can't imagine her serving anyone. It also makes Hammond the lesser of two evil I guess. He wants to save the world. 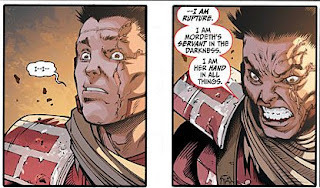 Lastly, I don't show it here (outside of the snippet of her head in the lower middle) but Barrows really adds to the feeling that the Queen is bigger than life, or certainly perceives herself as greater than everyone, by having her on the page outside of panel borders, breaking down artistic walls. Hammond takes over the minds of some of the citizens the Queen has enslaved and a drone war ensues. I love how Hammond's slaves are easily recognizable by their large heads. 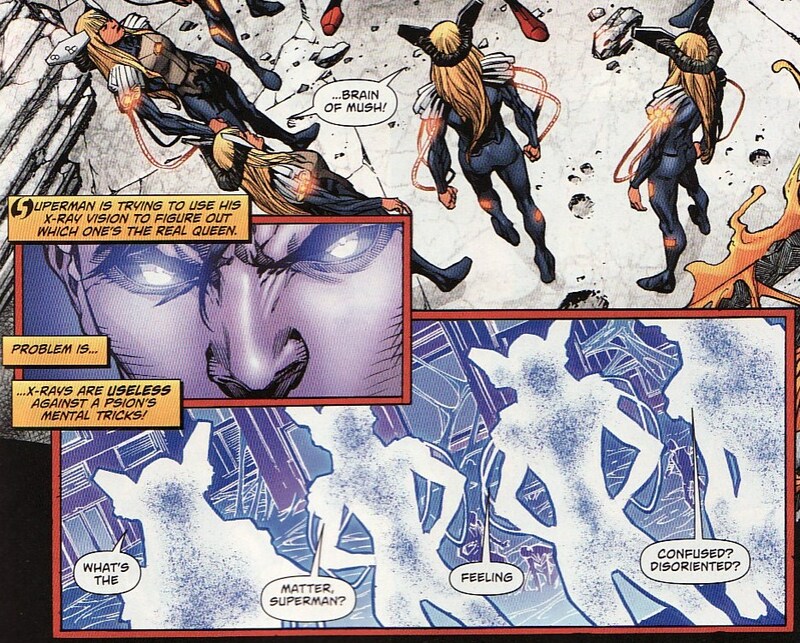 I have to assume that is some psionic projection as they are able to move around easily and fight. It turns out that Hammond is actually physically still in the HIVE headquarters. His presence is an illusion. Angrily, the Queen flies off to confront him and that frees Superman. He then has to work his way through the attacking citizens. I do think it odd that the Queen seemed so surprised that Hammond was at HIVE. Didn't he just kick her out of it last issue? Isn't that why she is sort of holed up somewhere to begin with? Nice view here, looking down at Hammond's shattered body. The emphasis should be on him because we have seen him dominate over that last couple of issues. And his frame and head has been such a important visual on this arc. So this angle helps move the story. Despite everything we have seen and know, Hammond is defeated. And the Queen ... dead?? At last we learn that the narrator is The Psycho Pirate, who was narrating his own story at the beginning of the issue. And he sounds even more powerful than the old Crisis-era Pirate. And to have taken out Hammond and the Queen so easily is unreal. Calling Superman Clark is a nice line to end on. But if he really controls all the minds on Earth, why he is flitting around a high school over in Superboy? I think this was a fine issue. It does what a middle chapter should do, move the plot along, add some new wrinkles, and bring us closer to an ending. Things are different at the end of this issue than they were at the beginning with the two big players in the war now defeated/dead and a new player on the board. This read very much like a Lobdell book so Johnson kept the feel of the story unruffled. And I actually think that Merino can channel Barrows enough to keep the book looking slick. I have enjoyed this Psi-War arc making the imminent Krypton Returns that much more scary in my mind. The lingering questions I have involve these members of The Twenty staving off death and mutation as well as Superman's mental blocks no longer working. I have talked for a while on this blog about some of the issues I have with the current New 52 DC Universe, this feeling that it is an overwhelmingly depressing place to live. The powers-that-be will call it grim and gritty, or realistic. But the truth is that the longer this universe and these books come out, the more unrecognizable things are becoming. There doesn’t seem to be a super-hero who is happy being a hero, happy to be helping people. Superman is a loner who doesn’t want to mentor his family, someone who floats over everybody. In countless books, in continuity or out, he has become a killer. Supergirl is a disaffected teen running from her new world. Her father has once again been turned into a super-villain. 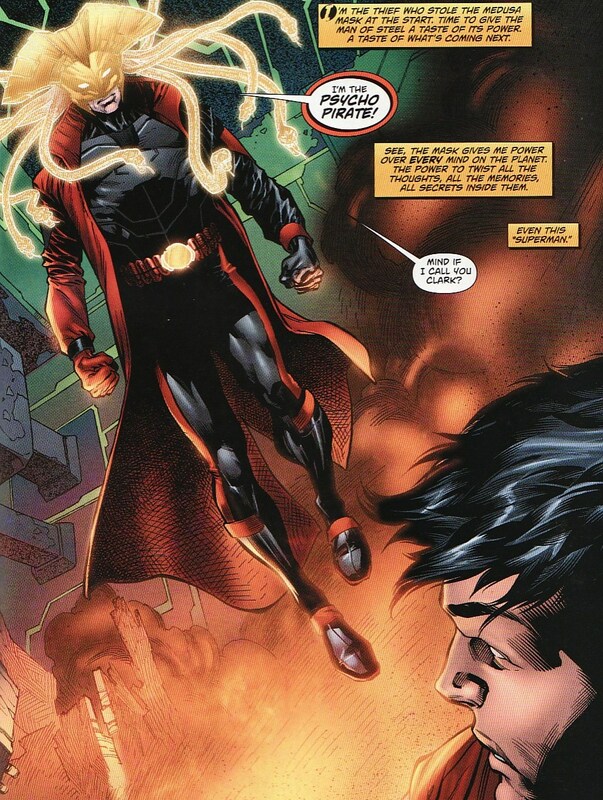 Superboy is a brainwashed weapon, a bank robber who carries the DNA of a maniacal genocidal alternate future son of Clark and Lois. The Amazons seduce and kill men to create the next generation, trading male children into slavery for weapons. Wonder Woman is a warrior only, never an ambassador for peace. The Legion can’t be made dark enough to sustain a title and so it is canceled, replaced by JLA3000, a book that Kevin Maguire is kicked off of because the book needs to be darker than his art can support. It felt as if the whole DCU was cut from the same grimmer and grittier cloth. And a palette of one color becomes boring pretty quickly. Throughout this new universe, I kept looking for a least one book that might have a different viewpoint, a book where characters were being heroes because it is the right thing to do. Someone who realizes that in this world it is harder to be good but you have to … because, to quote the competition, with great power comes great responsibility. The new Ameythyst? The Teen Titans? The Justice League? Have you read those books? Nope. Maybe Demon Knights? After all, the purest and most noble of characters, The Shining Knight, amidst others that are beautiful shades of gray. It was doing it. But that book has already been canceled. And then there was Vibe. Initially written by Geoff Johns and Andrew Kreisberg and then handed over to Supergirl-scribe Sterling Gates, Vibe stars a character trying to do what’s right in a cynical and grimy world. 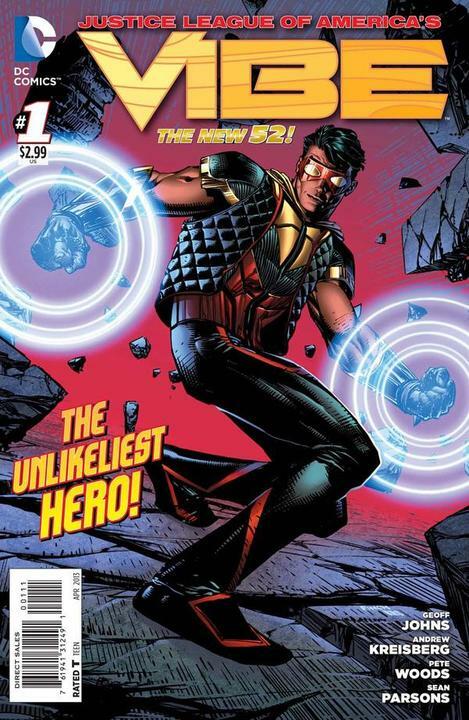 Cisco Ramon is a teenage boy given fantastic powers. 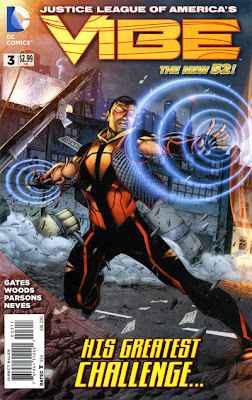 He is approached by the government group ARGUS to be part of a new Justice League of America and he jumps at the chance. He wants to honor the memory of his presumed fallen brother. He wants to help his family. He wants to help people. So he jumps at the chance. Given the codename Vibe, he goes beyond the missions given to him, patrolling the streets and trying to fight crime. Why? Because it is the right thing to do. 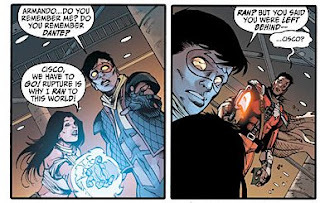 And when it becomes clear that ARGUS isn’t exactly acting above board, when Cisco realizes that ARGUS is imprisoning people, making Vibe try to capture innocent people, asking him to attack other breachers, he says no. He doesn’t fall in line. He doesn’t follow orders. He does what’s right! He turns against his bosses and helps the people who really need it. 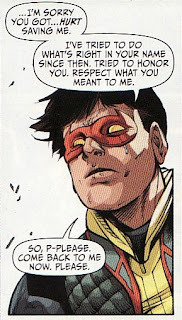 People like Kid Flash and Gypsy. It isn’t easy to do that. It isn’t easy to stand up against government-funded evil and be a hero. But he does it. Moreover, his ethics inspires others to do the same. Dale Gunn, his handler at ARGUS, is portrayed as a good man who at some point decided to follow orders even when he thought the orders were wrong. He did this to protect his family. He is a perfect reflection of Vibe. He was Vibe. That is, until he compromised his principles and fell in line. 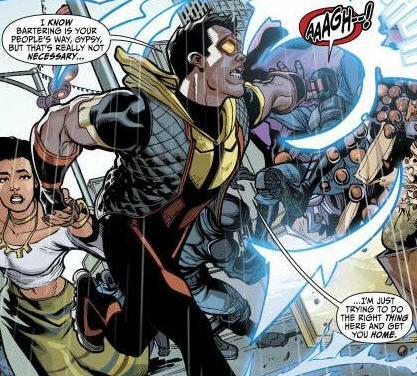 When Dale sees Vibe helping Kid Flash and Gypsy, he begins to question his own decisions. He even helps Cisco’s brother break into the Circus to rescue his brother. Vibe, the young hero, inspiring others to be better! In this market, it’s a wonderful change of pace. Long time Supergirl readers shouldn't be surprised that Sterling Gates has a handle on a young hero, striving to do what's right, and learning their place in the world. Outside of the optimism of the book, and as a great bonus, Gates clearly has a comprehensive knowledge of the DCU, dropping in such other-dimensional beings like Lady Quark, Maaldor, and the Warlock of Ys … Easter Eggs for long time fans. The last issue of Vibe sold just over 12,000, a probable death sentence for the book. With title after title after title showing a grimy world where heroes can’t be heroes, who don’t like being heroes, who don’t want to be heroes , in a dark gray world, can’t DC have one title that brings the light? That has optimism? Sometimes I want a horror movie. Sometimes I want a comedy. Sometimes I want a drama. What a boring world this would be if there were only horror movies! Can’t comics have the same? Isn’t there room for something more positive? Especially in the DCU where things are so dismal right now that next month I am going to be rooting for the villains because ‘evil is relative’ and there are even worse villains. And please … before anyone says I am old-fashioned and want a saccharine world of the Silver Age … I will defend myself by listing some titles on my pull list: Conan, Fatale, Danger Club, Satellite Sam, Rachel Rising, and Revival. I am not against darker stories. I am not against violence in stories. I understand the world we live in. But I also know that I want options in my entertainment. And I sometimes want to believe in the inherent goodness of humanity and in the existence of heroes. That’s why DC Comics needs Vibe. In this market he is the Unlikeliest Hero. Why? Because he is a hero. Superman Unchained #3 came out last week and continued to be a very engaging story with multiple plotlines moving forward. It is only a matter of time before all of them come together, threads weaving a tapestry. One thing that I like about this first arc is the scope of the story. This is Superman writ big, looking at what the world would be like if there was a pro-active military-based super-power working for America. This is hardly the first time we have seen something like this but usually those stories have the Superman character being raised differently. Here it is another super-being and Superman has to deal with his existence. How can this end? Hopefully not the same way the Man of Steel movie did. 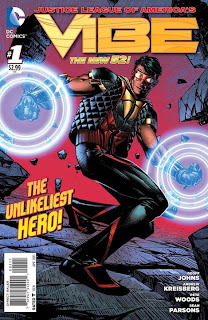 Writer Scott Snyder continues moves that action pretty briskly, working in a classic comic book device of two heroes initially fighting and then teaming up. But action alone can't carry a book for me. I need characterization. Snyder has the right voice for Superman and Lois, both playing major roles in this arc. But he also makes Wraith interesting. And he also makes General Lane a more three-dimensional character, and less of a caricature. That alone is a great feat! 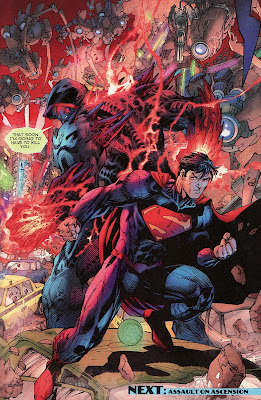 Jim Lee's art is solid enough if less detailed than I am used to seeing from him. That said, the big moments have big art which is always key. And the page layouts vary nicely with a mix of both splash pages and small inset panels as well. But I have to say, I am wondering how all these plotlines will end up intersecting. And when I am puzzled, I am more invested reader. We start out in 1938 when Wraith first arrives on Earth after the United States has sent into space a mathematical equation hoping to get a response. 11 seconds later, Wraith crash lands on Earth. Of course, 1938 isn't just plucked out of the air. It is a nice little homage to the first appearance of Superman. 11 seconds seems like an awfully quick time for a response to happen. Although I don't understand astrophysics enough to know if that is awfully quick or not. And we know now that Wraith is apparently an alien. That makes the eventual comparison and contrast to Superman that much closer. Two aliens who can process yellow sun energy land on Earth and have very different experiences. 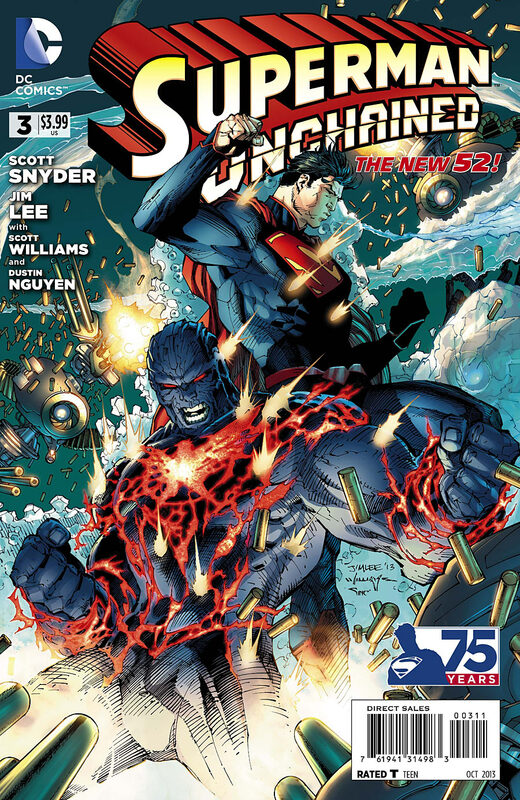 After that flashback, we pick up where last issue left us, with Superman facing off against Wraith and Lane's troops. Feeling threatened, Superman decides to both fight and take flight. This is one of those multi-panel set-ups that I don't necessarily associate with Lee. 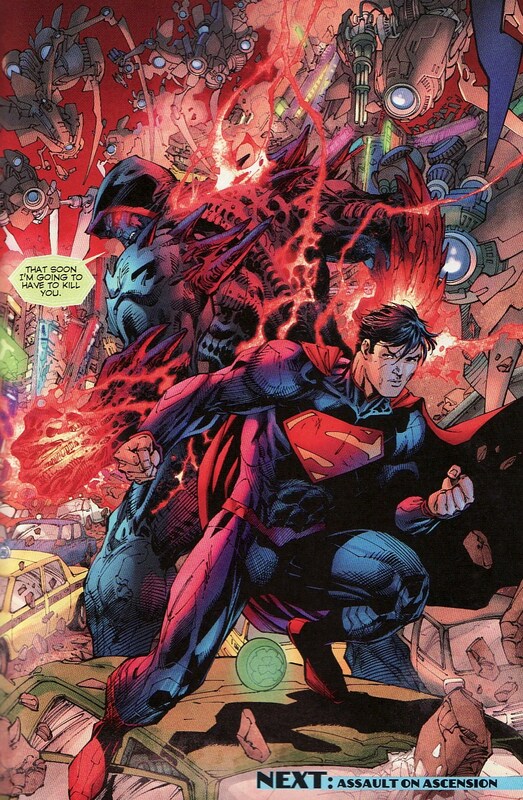 Wraith's cells are packed with energy and he is pretty tough too, stronger and faster then Superman. But one of the things I like is that Wraith himself doesn't seem like a toadie to General Lane. He actually wants to talk to Superman, work with Superman. But that isn't how these things work in comics. Hard to know if we can call Wraith a hero but it is pretty common for two heroes to brawl the first time the meet. So we go from tight small panels with lots of story beats to big panels and crazy action. I liked the transition from one page to the next, jarring in a good way. 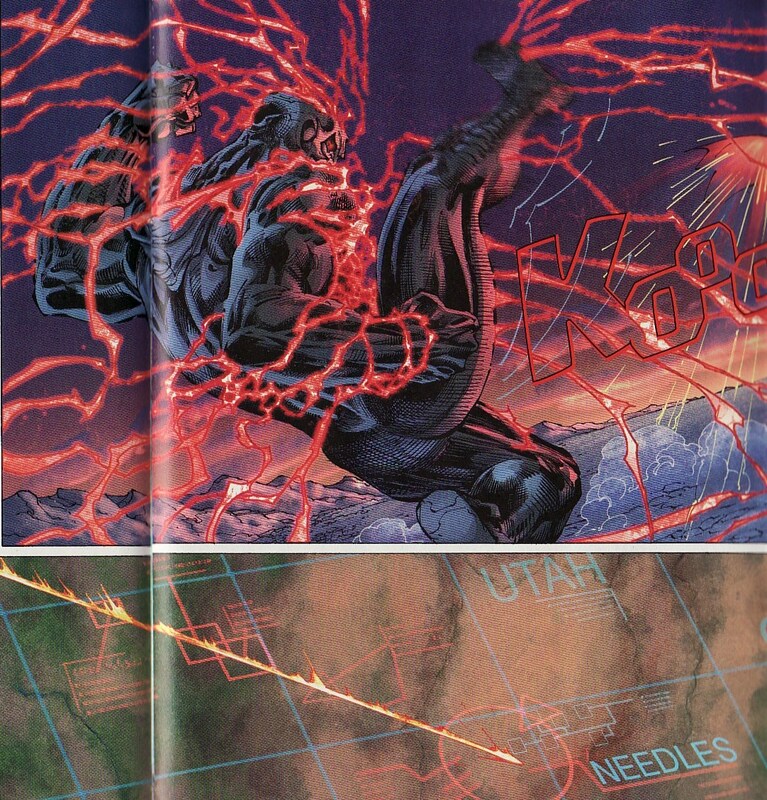 And we get a great sense of Wraith's power as we see him boot Superman across state lines. By using small panels the page before and then going big, I don't feel cheated as a reader. There is enough story packed in here to allow big art when needed. There was something sort of Dragon Ball Z-ish about that lower panel. I mean that in the best possible way! Now while the Wraith plot line is clearly in the forefront, the Ascension terrorist group and their maneuvers are still sizzling in the background. Last issue they simply cut out the power of the plane Lois was flying in. One thing I love about this book is that Lois is shown to be strong and independent, saving herself instead of hoping Superman will save her. So she grabs the controls and decides to land the plane herself, a sort of gliding belly-flop. But even better, she uses her brains, guiding the plane into power lines hoping that a massive blackout will bring a rescue party faster then their plane crashing would do alone. It's a brilliant scene for Lois. Love it. After their tussle, Wraith convinces Superman to join him in a conversation and to answer some questions. 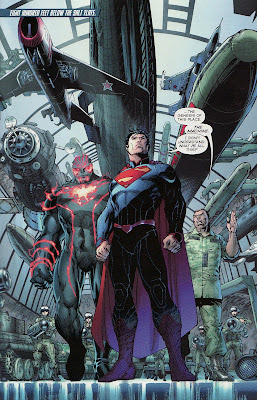 So this isn't Reactron and Metallo out to destroy Superman at General Lane's command. This is someone who thinks he is doing good and wants Superman to join him. The includes a tour of 'The Machine' a sort of shadowy black-ops military group, led by General Lane, which quietly and anonymously changes the world for the better. And Wraith is the key weapon. I love this shot, Wraith's fortress of solitude, filled with mementos from his prior missions. This isn't an interplanetary zoo and a giant metal diary. This is a different trophy room, again widening the differences between Superman and Wraith. I do like how Lane still has his men in the background aiming their 'black hole guns' on Superman. Even in a truce, Lane doesn't trust Superman. Now I am a firm believer that some villains think they are misunderstood good guys. 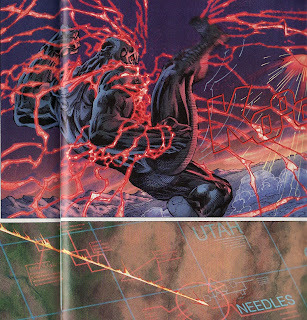 Here Lane is able to show on a map how unstable areas of the world are slowly growing smaller and smaller because of the Machine and Wraith. It is hard to deny results like this. Maybe Lane isn't such a bad guy after all? Or maybe he has no right to determine the fates of other countries? This is a nice gray area which makes Lane, for once, slightly relatable. Instead of a hand wringing xenophobe who hated just to hate, he is someone looking at the big picture. And then a very nice exchange. He doesn't hate Superman because he is an alien who was romantically interested in Lois. He hates Superman because Superman could be doing so much more in the world. He could be a 'hero' - at least how Lane defines it. He could be making the world better on a bigger scale. This is always the argument with Superman. Should he wrest control of the world and make it good? Or should he inspire good? Is he there to rule? Or, as Morrison said, there to pick mankind up when they fall? Should he eliminate evil by killing? Or should he be a role model of compassion? Whether it is Morrison's JLA or Kelly's 'What's so funny about Truth Justice and the American Way?' or even JMS' dark mirror of Supreme Power, we have seen this argument before. What I love about this is how it makes Lane a more realistic person than the lunatic who swallowed his own gun in War of the Supermen. As for Lois, the plane crashes into water and sinks. But before they can abandon the plane, the engines restart and the propellers actually bring the plane to the surface. The miracle? Someone wielding a blue crystal which seems to give them powers. Now the glow of this seems to be the same color as the glow of whatever anti-Superman weapon Bruce was hiding last issue. What is this thing? And how is it going to tie into everything? My guess is it can somehow give energy (as it did here) or take energy. Maybe it drains Wraith? And is it similar to what Bruce had, which we know was built to defeat Superman? Meanwhile, Ascension (which seems to be the biggest threat of the book) ends up hijacking Russian drones and sending them into Tokyo airspace. With a bigger threat to deal with, the Wraith and Superman put aside their political differences to work together. I think it fascinating that Ascension, an anti-tech cult seems to have major technology on their side. My guess is that someone has taken over the group for their own ends. Now Wraith has been a secret weapon, in hiding, and unknown to the world for 75 years. Doesn't this seem a bit conspicuous? Standing on a Tokyo roadway and standing on cars? Of course, we end with the threat. 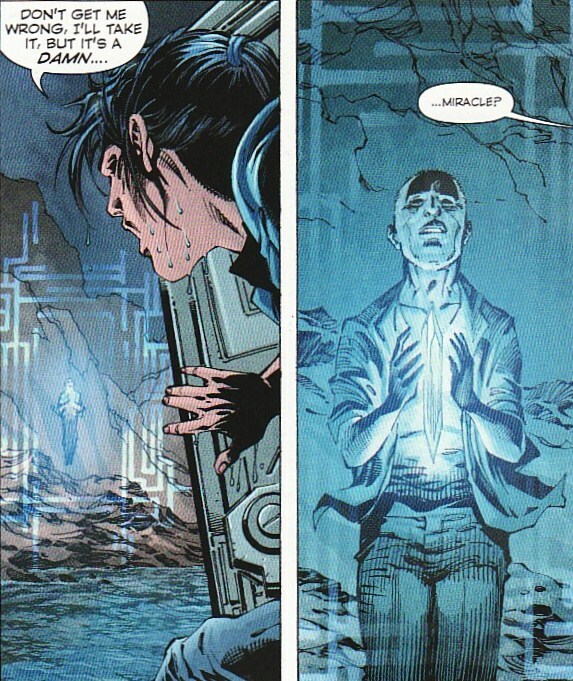 Wraith knows at some point he will kill Superman. As has been the case with the book, we get an epilogue by Peter Nguyen. The last plot has been Luthor breaking free from prison by downloading his sentience into this robot frame, his body inert in the center. Where does he fit into all this? At first I thought he might be behind Ascension but now I don't know. And what the heck does he want with Jimmy Olsen? My guess - all he wants is the signal watch. Luthor wants to talk to Superman about some threat which could effect them both. I was pretty happy with this issue, mostly because of the more serious and less maniacal look at the US military and General Lane. Lois is treated very well. Wraith and Superman continue to be odd reflections of each other. And the multitude of plots all simmering along are like some puzzle. I am trying to figure out how it will all come together in the end. While Jim Lee's art isn't his usual dense pencils, there are nice flourishes. Another solid chapter in Superman Unchained. It has been something of a tough week for me in comics. In Supergirl, Zor-El has been once again cast as a villain. 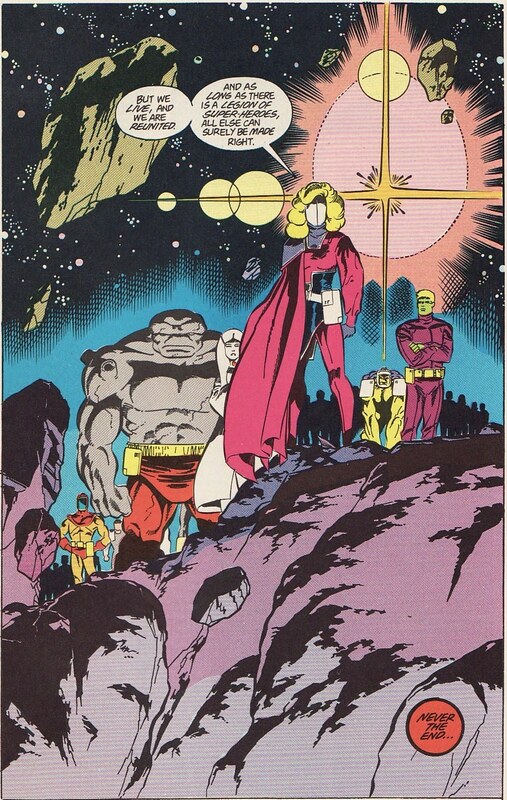 And in Legion of Super-Heroes, the beloved team got sent to comics limbo in a rather sad and humiliating way. Amidst all that offal was Vibe #7. Vibe continues to be a cut above the rest, a classic take on the teen super-hero albeit in the darker more sinister DCU.. There is a brighter take on heroism in this book than in almost any other DC book that I read as Cicso remains optimistic, believing in the inherent goodness of humanity, and struggling to honor his brother's memory. Like many classic heroes, Vibe's decision to be a hero is spurred on by tragedy. 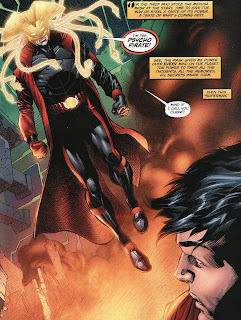 His older brother Armando saved him during the original Darkseid invasion, resulting in Cisco obtaining his powers. This inspires Vibe to help others. But before you think this is something you have read before, there is a key wrinkle. Armando didn't die. And it isn't all sweetness and light. Cisco has had to deal with being lied to and betrayed, showing it is hard to remain good in a cynical world. It is this attack on Cisco's ethics that I find most intriguing. Will he give in to everything around him and become coarser? Or will he continue to rise above. But it is a book about a hero and I love it for that. Add to that some seriously wild, wide-open action and a boatload of obscure DC characters and writer Sterling Gates has the recipe for a great book. With all dimensions open to him, Gates has access to almost anything! Pete Woods has left the book so art here is done by Andres Guinaldo and he shines here. Whether it is close-ups of expressions, people in civilian clothes, or giant para-demons fighting people in exo-skeletons, it all shines here. I hope he remains on as the regular artist. 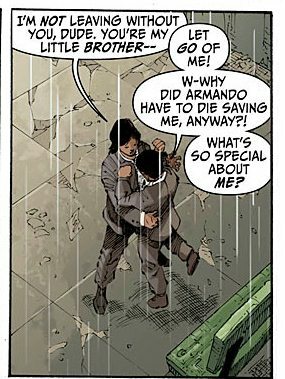 As I said, Cisco's impetus for becoming a hero and helping people is honoring his brother Armando's sacrifice. The book opens up with a flashback to Armando's funeral and Cisco, just a young boy, dealing with his survivor's guilt. I can understand how meaningful that moment was, how deep these feelings cut, how much this could impact Cisco. But as much as this issue is about Cisco and Armando, I love the third brother Dante. He has no powers but he is just as fiercely loyal to the memory of Armando, just as driven to help and do what's right. He is a quiet reminder that you don't need sonic powers to do what's right. 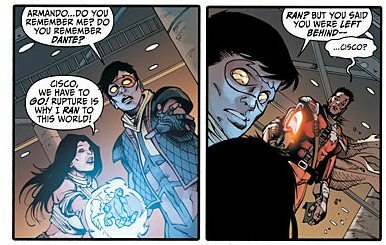 A couple of issues ago, Gypsy told Vibe a very romanticized origin, sounding so much like a fairy tale that even Cisco wondered if it could be true. At the time, I wondered if it was a lie. I thought that trusting Gypsy's story was no different than trusting the lines that ARGUS was giving him. In the aftermath of Rupture's appearance (Armando's nom de guerre), Gypsy comes clean. She wasn't marooned on Earth by her evil step-mother. She ran to Earth to escape. And Rupture is her step-mother's field general and assassin. She pleads they run. Everyone that Vibe has trusted has had a hidden agenda, has lied to him. Will he become jaded? Can you remain a pure hero, trusting in the goodness of mankind, in this dark DCU? And Armando being alive and clearly brainwashed is another interesting wrinkle to see if Cisco will crack. It is clear that Armando can try to fight his programming. But he is Rupture. If Armando's death was the what made Cisco accept his fate as Vibe, how will his being alive and evil affect him? Imagine if Uncle Ben was not only alive but a super-villain!!! And how do you truly battle your hero and inspiration? Great grist for the mill here. So there is great characterization in this book. And I love how you see Cisco truly struggling to deal with everything he is feeling about Armando's return and Gypsy's lies. But this was my favorite moment of the book. 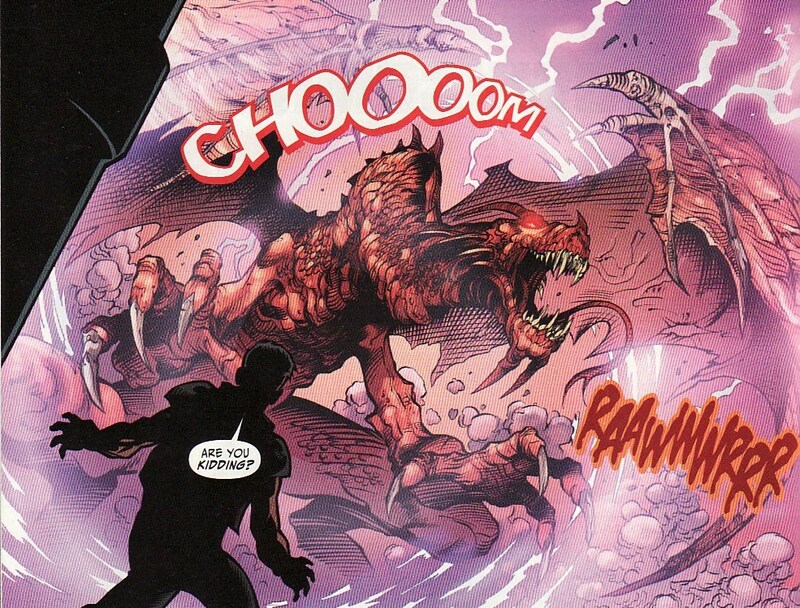 With the two brothers battling, their powers rip open the fabric between dimensions and in flies a dragon! I love Vibe's incredulous 'Are you kidding?" It is this crazy stuff that means at any point Gates can insert a knuckleball. A dragon in ARGUS? Awesome sauce! And it is clear that Guinaldo can handle a dragon assault as well as kids in suits at a wake. I have said before that the juxtaposition between Vibe and Dale Gunn is great for this book. To see Gunn re-find his morals and start defying ARGUS to do what's right shows just how inspiring Vibe himself can be! Here he swears to get Dante out of ARGUS in one piece. At least we get an explanation how Dante can still be alive after getting slugs to the chest. Gunn injected a nano-nurse! Still, I love seeing Gunn start to question the decisions he has made in life. Meanwhile, the brothers are still battling. There is a realism to Vibe's lines here. He is a young guy. Of course he would be flummoxed, exasperated, happy, and sad to see Armando back unfortunately as a villain. This must be heart-wrenching. That said, Vibe isn't backing down. His brother is trying to hurt people and Vibe isn't going to allow that to happen. During the battle Gypsy comes clean. Her step-mother is wicked, a dictator in her dimension. And that evil queen Mordeth bent Armando to her will when he arrived. I have to comment on the art here as we see Armando fall from the sky into that dimension. The use of him as a ghost or silhouette works well here, giving him a sort of celestial feeling, like a god falling from the heavens as opposed to an inner city kid. The use of the galactic background (as opposed to seeing it from the ground or just stars) increases that feel. But what I liked most was the blurred edges of the panel giving this a sort of dreamy, mythic feel to it. This one panel almost beat out the dragon one. It had a sort of Silver Surfer feel to it. And then my third favorite moment. You can feel Cisco's pain here as he pleads with his brother to break the spell and come home. I especially love how he wears his heart on his sleeve, talking about how he has done everything he could to honor Armando. And Guinaldo does solid work here. This is an understated expression here, not contorted in grief, just enough pain coming through, the single tear a nice touch. Vibe looks young here which he should. Oh but Gates isn't going to let this end easily. With Cisco standing there defenseless, Rupture buries his war-club (scythe?) into Vibe's chest, all the better to absorb Cisco's energy. Big moments need big art. And with that Rupture drags both Vibe and Gypsy through a dimensional portal to her home world. And on Earth, Argus is in shambles and Darkseid's daughter has escaped. Nice cliffhanger. So what can I say. After the disappointing Supergirl and Legion, I get another very solid Vibe issue, a book filled with action, some crazy action, and enough pathos to choke on. And throughout it, we have a kid just trying to be a hero because it is the right thing to do, no matter what sort of a morass he is wading in. Just solid stuff. I have seen more and more big name sites praising the book. I have seen tweets talking it up. I have beat the drum. I fear that this is an overlooked gem on the comic racks. I hope that DC doesn't pull the plug prematurely. They need this book. I need this book. 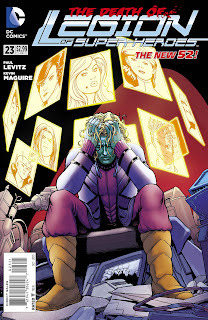 Legion of Super-Heroes #23 came out last week ... the end of the Legion. There certainly have been blips and pauses in the Legion's history, some months without stories of this storied team. But somehow this one seems more final. 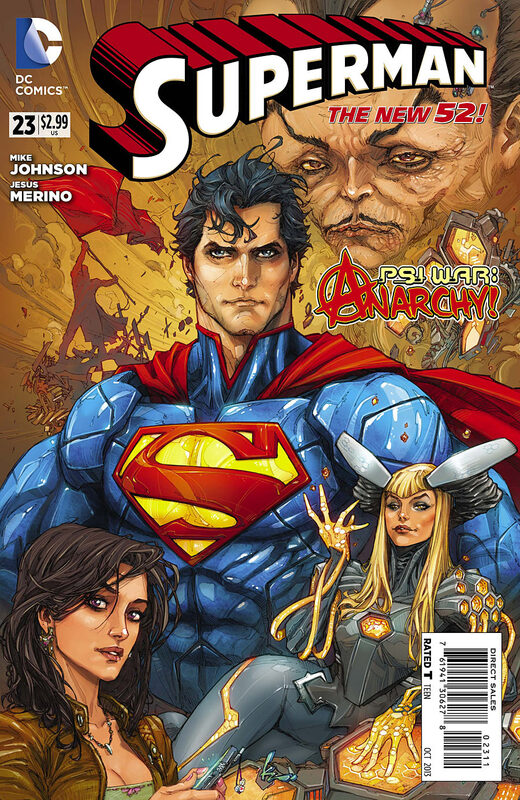 In a New 52 world painted only grimy and gritty, an optimistic future and a team like the Legion seems out of place. Even some creators have talked about the Leigion as if it were toxic, Keith Giffen swearing that JLA3K will be nothing like the Legion and there won't be visits to Braal (as if the planet's name is a dirty word). 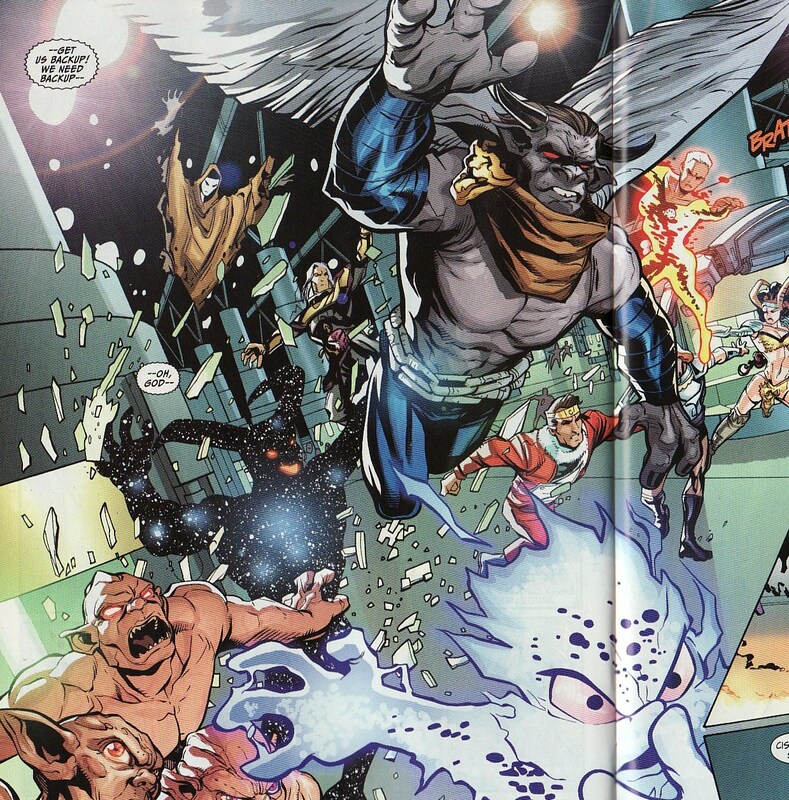 That's right, a darker and grimmer JLA3K will take the place of the Legion. 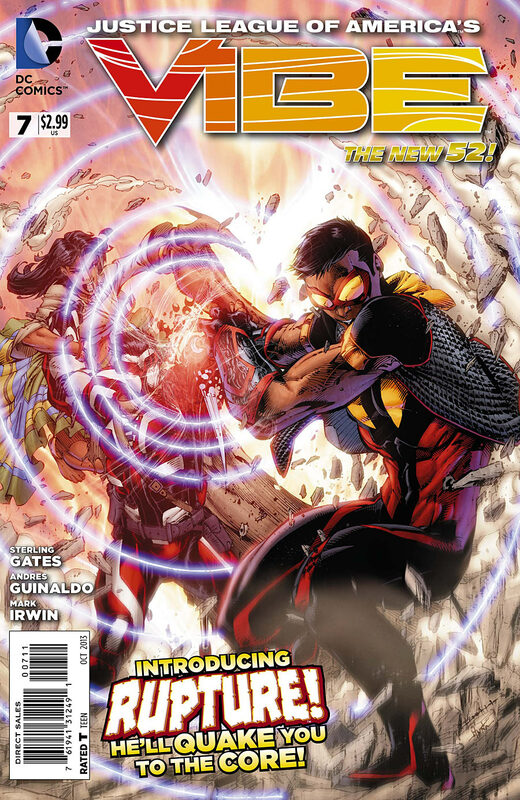 Perhaps what is sadder is that this title tried to become rougher, filling the last story with meaningless death and destruction, trying to shove the square peg of the Legion into the round hole of the New 52. As a result, this last Legion story is about as un-Legion as you can get. It truly saddens me that this issue is the headstone for the franchise because there is no optimism, no team spirit, no love in this issue. And for those Legion fans who have stuck it out, we at least deserved that. Instead we got death, despair, and disbanding. Sure there are some familiar beats and one major continuity wrinkle but the thing that stuck out for me was some of the dialogue here. There are plenty of lines that sound like they could be coming from writer Paul Levitz or even long time readers, lamenting what has happened to this team and, metatextually, this book. The art here is by one of my favorites Kevin Maguire and he brings his usual panache of facial expression and clean lines. I wonder if he got this gig because he was originally named as the artist for JLA3K before the title was considered too dark for him. This book ended. The Legion are basically in comic limbo right now. And I didn't even get a 'Long Live the Legion!' Enough intro. On to the book. The book starts on Shanghalla, the floating cemetery for heroes. Polar Boy and Invisible Kid are mourning Sun Boy, whose head was crushed in a crash and whose body was eaten by aliens. Dream Girl is mourning the passing of her beloved Star Boy, who was killed by falling debris while the team tried to escape Earth. Do either of those deaths sound heroic? Or maybe asking differently, did those characters deserve a 'better' death? But it was Dream Girl's line that stuck out to me ... words I have thought and word I bet Levitz said himself. In her worst nightmares, she never foretold a future as desolate as this one. I hear you Nura. I do. Because this is about as dark a Legion I have read outside of the 5YL series (which I know I liked). We then head to Earth which appears to simply be a pile of rubble. Maybe the 31st century has a bunch of Wall-E's to cube it all up. 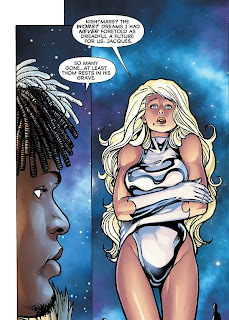 As much as I thought the deaths of Star Boy and Sun Boy were meaningless, I think the loss of Phantom Girl seems cruel. Phantom Girl had just been elected Legion Leader when this storyline erupted. At the time I thought it was a great pick. 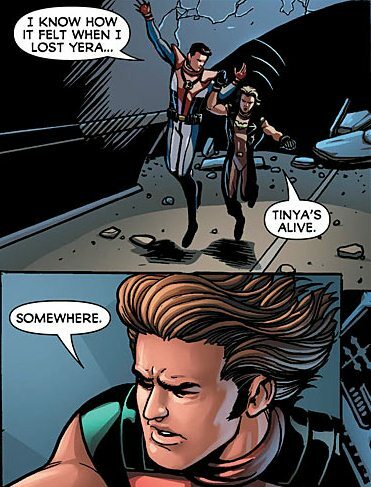 Tinya is level-headed and a veteran. This would be her chance to shine. Instead, the last memory we have of her is crying, completely hysterical, as she takes a one way trip back to Bgztl. And Ultra Boy, her long-time love, has to hold on to hope that she is alive somewhere. 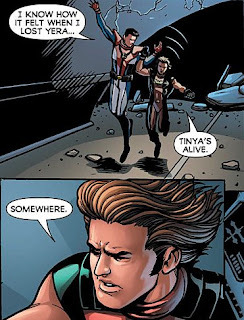 As it is, Colossal Boy thinks that Yera is dead because she was part of the Legion Lost gang, still marooned in present time, yet another sad ending for those characters. In the meantime, Brainiac 5 has a plan to bring it all back together. 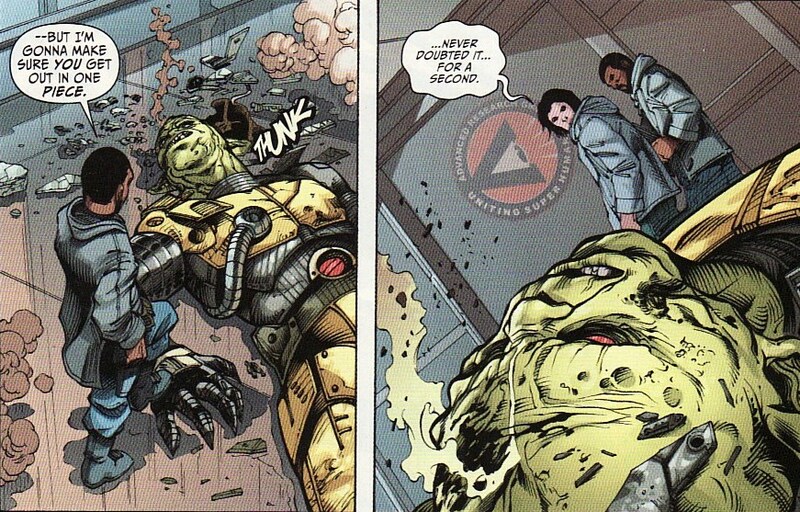 This seems to be motivated out of guilt as we learn it is original Brainiac tech that made Tharok so formidable. When he complains that Shadow Lass is taking Mon-El away to help him heal (yet another lousy ending for an esteemed Legionnaire, ripped to pieces and in a coma), Luornu puts him in his place. He isn't the leader so he should stop acting like it. There has always been history between these two. 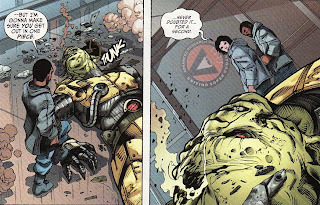 And Brainiac does seem to have a knack for unleashing horrors onto the universe - Computo and Omega included. So I like that she has the guts to confront him ngrily but then has that anguished look in the last panel - classic Maguire. If any Legionnaire has improved in the recent years, it's Luornu. She is tough! I also think that Maguire cues you in on which clone this is of Luornu by the number of holes in her boot. Sifting through the rubble of the destroyed Legion headquarters, Bouncing Boy finds Superman's shirt, one that has been speared. At first I thought it might be from the famous death duel with Doomsday, explaining why they formed the Legion in a Superboy-less New 52. But more on this later. 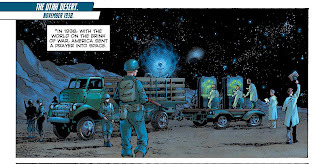 Ahat did strike me was Brainy's line, again which I think is some meta-textual jab by Levitz. Why do we have to worry about an irrelevant past ... that being DC's present. He's right. This current DCU feels irrelevant. And the gritty present seems like poor soil to grow something like the Legion from. As if things weren't bad enough, Science Police officer Gigi Cusimano arrives to say the United Planets are disbanding the Legion. That's that. This is the last page of the story proper. No rallying cry to stay together and fight evil. No 'you can't kill an idea; Long Live The Legion!" 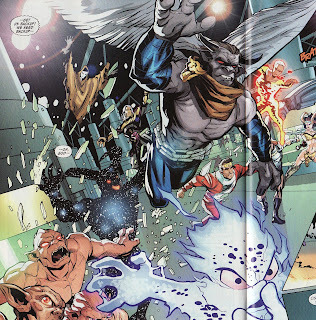 The last page is Cusimano telling a distraught Element Lad that the Legion is over, as she walks amidst what remains of their headquarters. Is this really the ending this book, this team, this franchise deserved? Does even this book have to end downbeat, bleak as the door closes on it? Levitz does give us some epilogues to roll through our heads. First is Nura, feeling out of place on Naltor. Again, is she speaking for Levitz or me when she says the whole thing feels like a bad dream. And then the curveball.Dou Damsel and Bouncing Boy talk about how maybe on other universes the Legion is doing better. That maybe everything is brighter and more hopeful. After all, in this universe, Superman was killed by Steppenwolf! 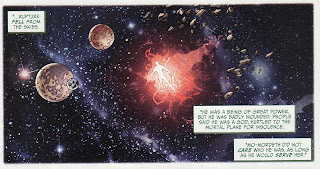 That means that in this New 52, the Legion is set in Earth 2's future. It seems wrong that the Legion can't exist as the primary future for DC's main Earth any longer. Of course, this opens the door for JLA3K to be written on a blank slate with no worries of Legion continuity. But this opens up some cans of worms. The Legion's continuity has seemed to be unaffected by most timeline-altering events like Crisis, Infinite Crisis, and the New 52. But this puts in a big wrinkle. How do we corroborate past stories? Or do we not? Does this mean Brainiac 5 had a crush on the Earth 2 Supergirl, now Power Girl? 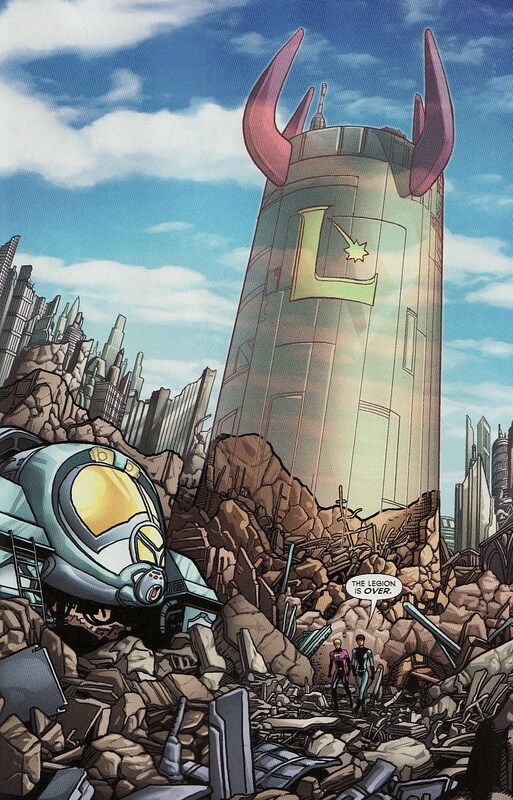 Does this mean the Legion Lost characters not only went back in time but jumped Earths as well? They definitely were on the prime Earth. I still think it feels wrong, like a slap in the face that this team which has been around for 5 decades isn't worthy of the future's top billing any more. At least Levitz ends it with the original three, relaxing on Winath. But again he waxes philosophical, wondering if this timeline is the only one or if the Legion lives elsewhere, in other universes and other dreams. I would hate to think that this is the end of the characters. In my mind, this is so poor an ending, I might try to forget all this happened. I bet Levitz also thinks about other places and worlds where the Legion can remain a team for good in a bright and positive future land. As I said, this isn't the first time the Legion has been shelved. The Baxter series ended with the Magic Wars storyline, opening the door for the more dystopian Five Years Later run. The stories are similar in tone. In this arc, technology stops working because magic takes over, leaving the galaxy in ruins even after the enemy is vanquished. But look at the end page of that series, the Legionnaires together, proud and strong, reunited and ready to still fight the never-ending battle. This is a far cry from a small Element Lad trudging through garbage. And so a chapter of my comic life comes to an end. My guess is the Legion characters are going to be considered too toxic to touch for a while. Heck. maybe there will be a true Five Years Later. Maybe in 2018, someone at DC will realize that there is a whole team of characters with great history and depth collecting dust, a team worth another chance. Look, I wholly admit that this book, while under Levitz, has been pretty stale for the last several years. But I don't think the characters need to be completely shelved. And I certainly think they deserved much better than this. When the Boston Comic Con was originally announced I was thrilled to see that Amy Reeder was among the guests. And when it was rescheduled, I was thrilled to see her name still listed in Artists Alley. 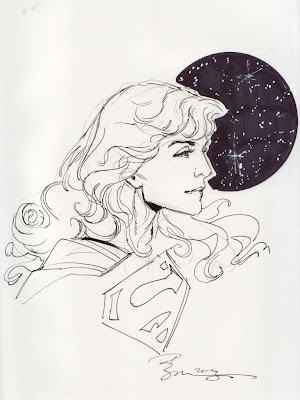 I loved Reeder's work on Madame Xanadu with Matt Wagner. 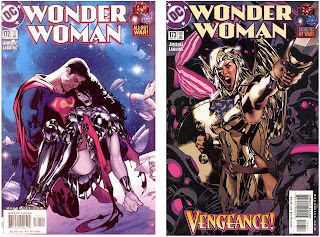 And I really loved her covers on Supergirl during the BizarroGirl arc and beyond. 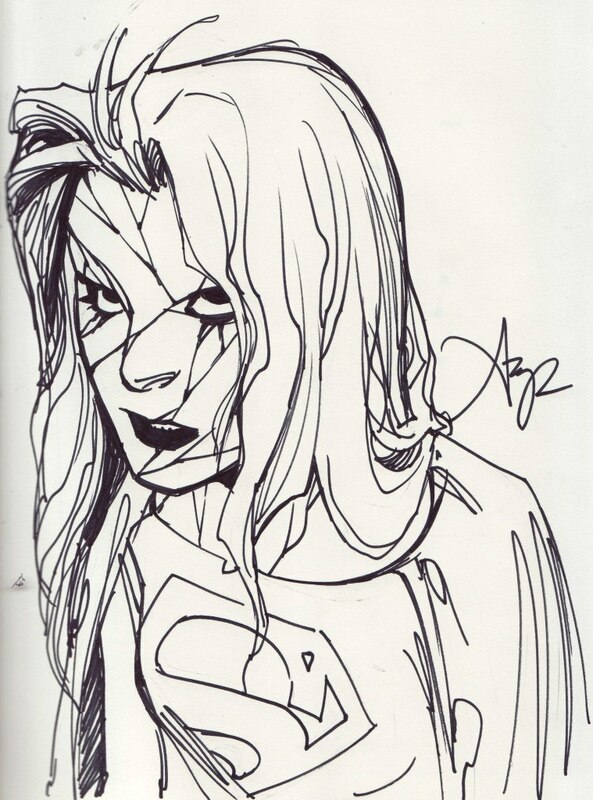 I already had a quick sketch of Supergirl by her (grabbed by a friend of mine at an earlier convention). But I wanted to chat with her and get a sketch in my sketch book. 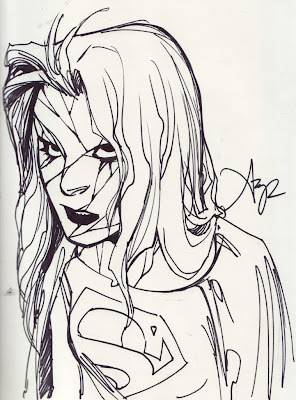 And since I decided to branch out a bit, and since I already had a Supergirl, I opted to go for a BizarroGirl sketch. I couldn't be more thrilled with the commission. I always thought that Reeder's take on BizarroGirl was like a cracked porcelain doll and this evokes that nicely. She said she wanted BizarroGirl to look the opposite of the classic sweet Supergirl and so she tried to put heavy Goth style makeup around the eyes. I love the look of subtle malevolence on the face here. So I talked to Reeder about Supergirl and there was a man sitting at her table who talked about Supergirl and Jim Mooney for a while. When I pulled out Halloween Eve to get signed by her, she asked if I wanted the man at her table to sign it too; he was writer Brandon Montclare. 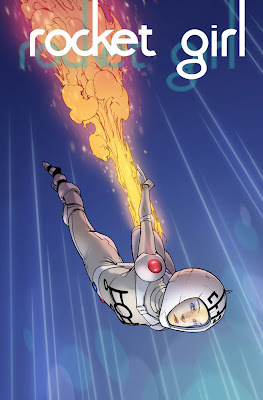 I then got to talking about their upcoming project Rocket Girl, a book I am very excited for. The first issue is scheduled for October 9. Can't wait! Anyways, it was great to finally meet Amy Reeder and talk. Meeting Brandon Montclare was a bonus!